The Week of Prayer for Christian Diversity prays that we realise that agreeing to disagree will be the only way forward. Conflict over doctrine, often doctrine that, in retrospect, is anything but central to the gospel, has bitterly divided Christians over the centuries, has even inspired wars. In our own day, the status of homosexuals in the church and society has been an issue that has seriously divided the Anglican Communion. I feel confident, however, that, in the twenty-second century, homosexuals will no longer be a special group we argue about; they will simply be people like the rest of us (including women, of course), who will routinely marry and be ordained without any special notice. Moreover, the historical arguments within the church about homosexuals will be seen as ignorant and trivial. Agreeing to disagree about homosexuality now—tolerating our present diversity—will get us through our present uncomfortable divisions. This is not to say that tolerating diversity always leads to an eventual consensus. It does, I think, lead to perspective and, in many cases, to a common view. (One is hard-pressed to find Christian defenders of slavery today.) But there appears to be an inexhaustible source of disagreements among Christians, and, as old debates die down, new ones are born. There is, however, a positive aspect of diversity. The willingness to articulate unorthodox, even heretical, ideas within the church is necessary for the kind of dialectic that leads to new insights, and, ultimately, to new consensus within the church. Abolitionists within and outside the church, were needed to challenge the orthodoxy of the acceptability of slavery in order to bring the church to a new missional understanding that enslaving our fellow human beings is fundamentally wrong. We therefore should be praying for a tolerance of diversity to prevent unnecessary and damaging disunity within the church, but we should also be praying that our comfortable but mistaken beliefs will be challenged by those willing to oppose the current orthodoxy. The forgoing is really an introduction to things I have written over the years which were informed by my work with Progressive Episcopalians of Pittsburgh involving trying to prevent the schism that eventually befell my diocese. This will, I hope, contribute to the commemoration of the Week of Prayer for Christian Diversity. More information about this collect can be found on my Web site here. More information about this poem is available here. More information about this poem can be found here. Postscript. It seems only fitting that I should include another poem of mine in this little essay that is actually titled “Diversity.” The poem—a limerick, really—is not about theological diversity, but its subject is not unrelated to ecclesiastical concerns. This poem was written in July 2000 and was tweaked a bit a few years later. More information can be found here. Consider this comic relief. This week acknowledges and is honest about our diversity. In the Northern Hemisphere, Christians have just concluded a Week of Prayer for Christian Unity. In the Southern Hemisphere, the Week of Prayer for Christian Unity happens in the Easter Season. Christians cannot even agree when to pray for unity! Let us be honest about our extreme diversity of beliefs. Let us be honest about our enmity—Christian against Christian. Let us be honest about our disagreements. Let us be honest about the diversity of our actions—from some really good stuff, to quite a bit of downright evil. Let us be honest about getting some things right, and quite a bit wrong. Christian unity is a lovely idea,, but Bosco wisely recognizes that, to many Anglicans, unity means uniformity. Thus, he concluded, we must celebrate Christian diversity explicitly. Bosco is on to something important, and I plan to celebrate the Week of Prayer for Christian Diversity as best I can. 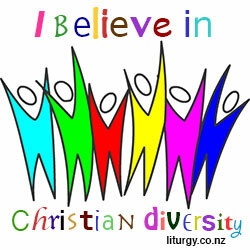 I have adopted Bosco’s badge celebrating Christian diversity. 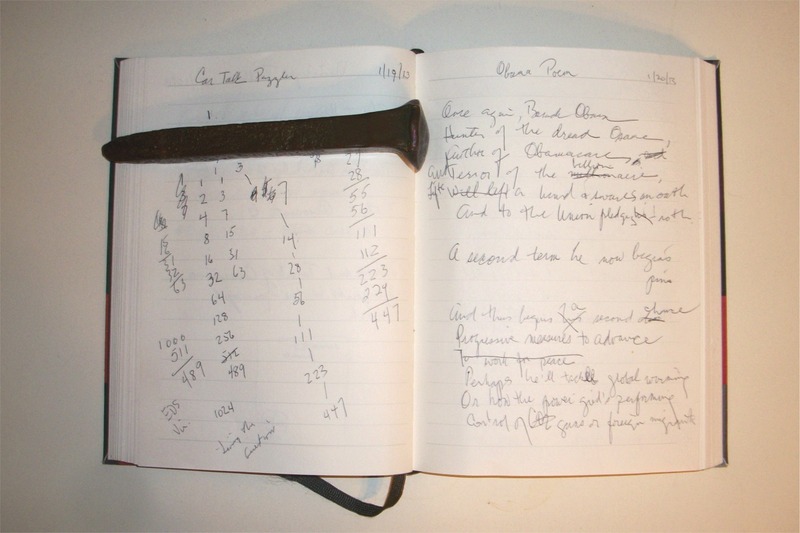 I have reproduced it below, and it now graces every page of my blog. I encourage other bloggers to adopt Bosco’s badge as well. “That they all may be one” does not mean—should not mean—“that they all may agree.” There is one Lord, one faith, one baptism, but that faith is not a large set of propositions on which all Christians must agree. Let us each proclaim and live out the gospel as we understand it and love our Christian brothers and sisters, even when their understanding of the gospel differs from our own. I wrote a poem for Barack Obama’s first inauguration. That poem, “Hail Barack Obama,” was perhaps overly optimistic in tone. Four years later, we face President Obama’s second inauguration more soberly, but we must hope that he can help us bring about a better America. 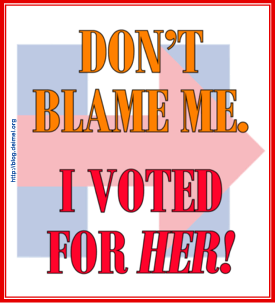 I could hardly help writing a second poem for an Obama second inauguration. That poem—or perhaps only a first draft of it—is below. I began writing it yesterday, the day on which Mr. Obama took the official oath. I finished the poem today as the President was just beginning his inauguration speech. And to our Union pledges troth. All will vex Obama’s nation. That change our future may attend. Trends can be hard to spot, sometimes even if you’re caught up in them. Having someone name an ongoing phenomenon of which you have been only subliminally aware, however, can be an epiphany. I had such an epiphany while reading an article published by Political Research Associates. “The New Religious Freedom Argument: Gay Marriage in the 2012 Election” by Amy L. Stone points out that the religious Right is trying to expand the notion of freedom of religion beyond what is normally thought to be guaranteed by the First Amendment. The argument recently advanced by Roman Catholic bishops in support of exempting church-related institutions from provisions of the Patient Protection and Affordable Care Act (ACA) was perplexing to me. It was not at all clear why requiring, for example, Catholic hospitals to provide reproductive services to their employees impinged on the rights of management by requiring them to support something of which they disapprove. The government regulates commerce at many levels. In particular, it has long specified certain terms of employment through such legislation as minimum wage laws. The requirements of the ACA are no different in principle. If a Catholic hospital is required by law to provide no-cost contraception to female employees, how is it complicit in facilitating what the Catholic Church considers a sin? It is simply complying with a law passed democratically to which all employers in the country are subject. If a church-related employer is complicit in sin by providing contraception mandated by the ACA, is it any less complicit if an employee uses her wages to buy birth control pills herself? But the church has not argued that such an employee should not be allowed to buy the pill because it would compromise the church? Of course not; to do so would be ridiculous. It would make employment look more like slavery! Amy Stone’s paper demystifies the Catholic Church’s argument and those of the likes of Hobby Lobby, a private “Christian” company that is objecting to the ACA requirement to provide reproductive health services to its employees as a restriction on the owners’ freedom of religion. (Hobby Lobby is suing the government over the requirement.) In such cases, the proponents argue that they have a constitutional right to live life in accordance with their religious beliefs. If this expanded view of “freedom of religion” is embraced by a gullible nation—I suspect, or at least hope, that it will not be—it will result in an American society even more contentious and fragmented than it is already. It will not expand liberty, though it may provide more freedom to the wealthy at the expense of the non-wealthy, as if we need more of that in 2013. It is easy to see what Stone calls the new religious freedom argument as nothing more than a power grab. It is that, of course, particularly on the part of right-wing media agitators. Those people, however, have encouraged the bewildering phenomenon of Christian paranoia. Although, by any practical measure, the United States is the most Christian (or, if you like, Christian-friendly) country in the world, Christians on the right have been convinced that they and their beliefs are under attack. The craziest of the crazies are even planning armed insurrection in defense of their “rights.” God help us. The European Court applied exactly the same tests and measures that we have been advocating for years. They asked the question “Will this manifestation of a person’s religion interfere with the rights of others?” In three out of the four cases they found it would and rightly dismissed them. These cases have been repeatedly lost in court after court and have wasted an enormous amount of time just as they have generated a huge amount of unnecessarily divisive feeling amongst the public. The victim narrative that lies behind them, whipped up by the political Christian lobby groups that organise them and the socially conservative media that report them, has no basis in reality. The widespread misreporting of these cases under the guise of “Christian persecution” when they are anything but has undermined the chance of the public to get a really clear understanding of what the issues engaged by these cases really are. What they describe as discrimination and marginalisation of Christians is in fact the proper upholding of human rights and equalities law and principles – principles which protect all people against unfair treatment – and we are pleased that the court has recognised this. All reasonable people will agree that there is scope in a secular democracy for reasonable accommodation of religious beliefs when that accommodation does not affect the rights and freedoms of others. But if believers try to invoke their beliefs as a defence for treating other people badly – denying them a service because they are gay or claiming a right to preach at them in a professional context – the law is right to prevent them. It’s not persecution of Christians; it’s the maintenance of a civilised society for all. This past Sunday was the First Sunday after the Epiphany, and my church did indeed perform a baptism at the service I attended. Baptisms show up on our worship schedule unpredictably, however. The rector of St. Paul’s does not feel especially constrained by the paragraph above, which begins the Additional Directions that follow the Holy Baptism liturgy in the Episcopal Church prayer book. I have complained about our failure to restrict the times we celebrate Holy Baptism, but I haven’t been given much of a hearing. The most common reason for holding baptisms at times other than those suggested in the prayer book is the convenience of the family. In this busy age, it may indeed be difficult to assemble all the friends and family who want to be present for a baptism, especially if some are coming from out of town. My rector is hardly the only priest to succumb to the entreaties of the candidate or the candidate’s relatives. On the other hand, I have always suspected that my rector does not take “as far as possible” very seriously and is more interested in receiving another soul into the household of God than in applying at least a little pressure to schedule a baptism on one of the “especially appropriate” occasions. At Sunday’s service, another reason for restricting the times when our church celebrates baptism occurred to me. Additional Directions suggests that a candle may be given “to the newly baptized or to a godparent.” My church does this, and I do think the candle well serves as a reminder of an important spiritual event. My rector sometimes suggests, when presenting the candle, that it might be lit on the anniversary of one’s baptism. He has suggested that the anniversary be honored on the same date every year, say, on February 3. However, with so many dates to remember—birthdays, anniversaries, holidays, and the like—a personal baptism date is likely to be forgotten. My epiphany was that, although one might not easily remember having been baptized on February 3 in some year in the distant past, it would be easier to remember having been baptized on, say, the Day of Pentecost. If the baptized person regularly attends a liturgical church and is aware of the church calendar, remembering one’s baptismal day becomes significantly more probable, perhaps even an anniversary that will be anticipated in the days leading up to Pentecost or one of the other feasts of the church. One might even be inclined to rummage around in some little used drawer to find that baptismal candle. This is another, and perhaps better, reason to take the prayer book direction seriously. I might even try out the argument on my rector. 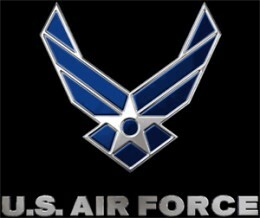 Do you think that female Airmen is acceptable in 2013 America? If not, what alternative would you like to see? Would Air Force women work? I was saddened today to learn that singer Patti Page died on New Year’s Day. She was 85, having been born Clara Ann Fowler in Claremore, Oklahoma, in 1927. 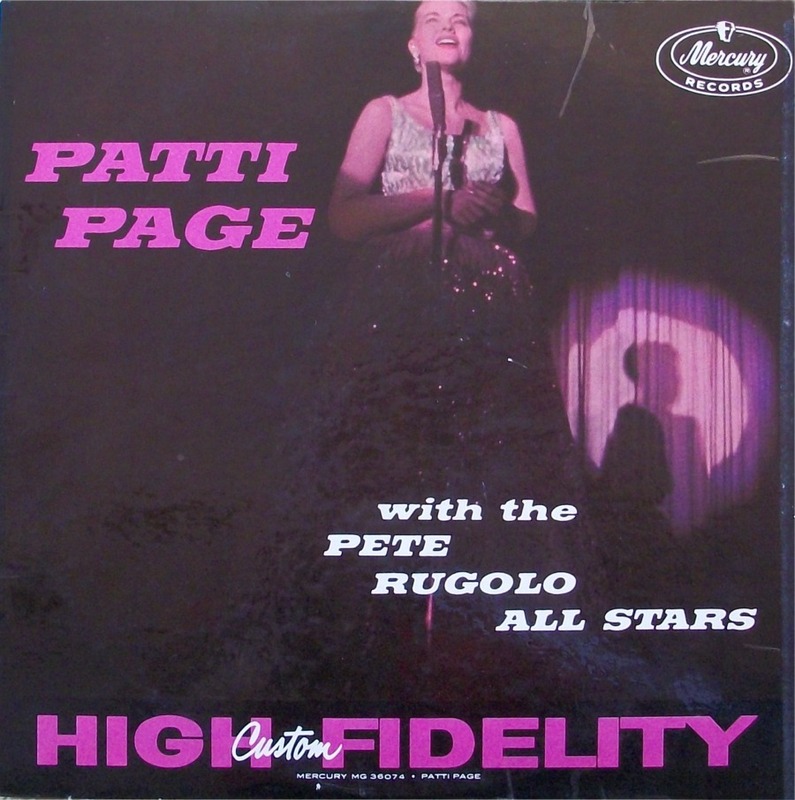 Over the years, Patti Page sold more than a hundred million records, but she did not always get a lot of respect from music critics. In fact, she was an accomplished singer whose repertoire (and fans) spanned genres. She began as a country singer but is probably best know for her pop hits. Her voice was sure, and she always retained a certain country twang. Of her well-known songs, “Tennessee Waltz,” “Old Cape Cod,” and “Allegheny Moon.” are my favorites. I am fond of her occasional use of overdubbing, allowing her to act as her own backup singers. (A good example of this technique can be heard in her original recording of “Old Cape Cod.”) “Doggie in the Window” is unforgettable, but a bit cute for my taste. 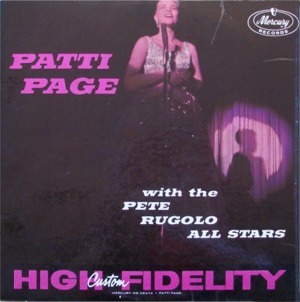 I own only one Patti Page album, the 1956 In the Land of Hi-Fi (see photo). It is perhaps out of the mainstream of her oeuvre, but it is a prized element of my record collection. My mother bought the album for me along with several other discs to build up my meager LP collection shortly after I got my first phonograph capable of playing LPs. In the Land of Hi-Fi includes songs by Cole Porter, George and Ira Gershwin, Rodgers and Hart, and others. The jazz arrangements on the album are by Pete Rugolo, who also conducts an orchestra of 23 musicians. I have a hard time picking favorite tracks from this album, but I will mention a few favorites: “Love for Sale,” “The Thrill is Gone,” and “Taking a Chance on Love.” This is the album that convinced me that Patti Page was a singer to be taken seriously. Patti Page was to receive a Grammy for lifetime achievement in February. Unfortunately, the award will be posthumous. I will miss her.